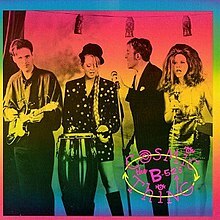 All tracks written by Kate Pierson, Fred Schneider, Keith Strickland, and Cindy Wilson, except "Roam", music by the B-52's, with lyrics by Robert Waldrop. ^ Erlewine, Stephen Thomas. "Cosmic Thing – The B-52's". AllMusic. Retrieved August 23, 2016. ^ Heim, Chris (August 3, 1989). "The B-52's: Cosmic Thing (Reprise)". Chicago Tribune. Retrieved August 23, 2016. ^ Farber, Jim (July 13, 1989). "The B-52's: Cosmic Thing". Rolling Stone. Archived from the original on November 14, 2007. Retrieved August 23, 2016. ^ Considine, J. D. (2004). "The B-52's". In Brackett, Nathan; Hoard, Christian (eds.). The New Rolling Stone Album Guide (4th ed.). Simon & Schuster. pp. 67–68. ISBN 0-7432-0169-8. Retrieved November 2, 2011. ^ Weisbard, Eric; Marks, Craig, eds. (1995). Spin Alternative Record Guide. New York City: Vintage Books. ISBN 0-679-75574-8. ^ Christgau, Robert (October 3, 1989). "Consumer Guide". The Village Voice. Retrieved August 23, 2016. ^ "The B-52s - Chart history - Billboard". Billboard. Retrieved 2016-02-19. ^ "cosmic+thing - full Official Chart History - Official Charts Company". Retrieved 2016-02-19. ^ "THE B-52'S - COSMIC THING (ALBUM)". Retrieved 2016-02-19. ^ "The B-52s - Chart history - Billboard". Billboard. Archived from the original on April 1, 2013. Retrieved 2016-03-24. ^ "American album certifications – B-52 – Cosmic Thing". Recording Industry Association of America. If necessary, click Advanced, then click Format, then select Album, then click SEARCH.